The following was approved for public release on February 10, 2014. Over the past twenty years, the Department of Defense (DoD) has acquired a diverse portfolio of Unmanned Aircraft Systems (UAS) across the Military Services to meet its national security needs. Newly emergent threats and evolving national security requirements are prompting the DoD to re-evaluate its entire portfolio of systems, while at the same time, seeking to reduce the total ownership costs including lifecycle sustainment costs of these systems. The anticipated reduction in defense spending in concert with advances in information technology provides ample opportunity for DoD to rethink how it acquires, designs, and builds its systems. As a result, DoD is adopting and exploiting open system design principles and architectures to increase competition, foster reuse across systems, and increase interoperability. This new acquisition model requires access to multi-vendor solutions to enable rapid insertion of new technologies to counter emerging threats, avoid technology obsolescence, and decrease time to field new capabilities. 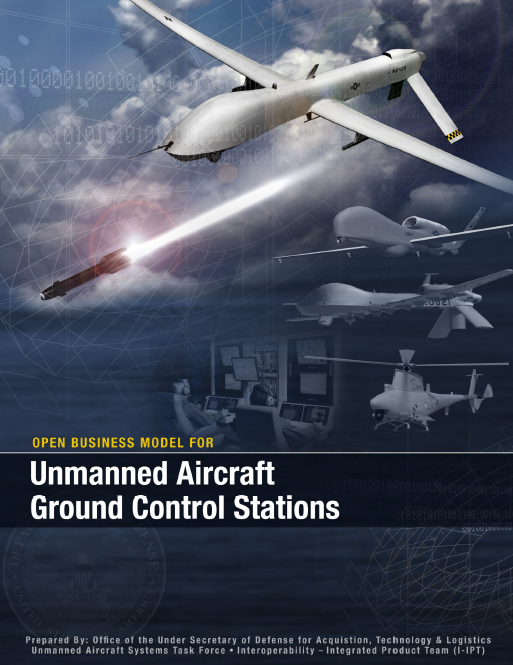 DoD is adopting an Open Business Model (OBM) to support the implementation of an Open Architecture (OA) for UAS Ground Control Stations (GCS) in order to drive greater acquisition efficiencies and reduce the total ownership costs. This new model is built upon several lessons learned from the Navy’s own open architecture efforts in the submarine community when it radically changed its approach to building weapon systems due to an emerging threat from an adversary in conjunction with declining budget. Within the confines of this framework, DoD maintains a UAS portfolio of 11 Programs of Record (PoR) across the Services. Six prime integrators support this UAS GCS portfolio. These six integrators represent only a fraction of the available defense, aerospace, and software vendor market that could provide innovative solutions for UAS GCS. The Deputy Secretary of Defense chartered the Unmanned Aircraft Systems Task Force (UAS Task Force) to facilitate collaboration across the Services and industry and address DoD-wide integration issues. The Task Force is chartered to coordinate UAS requirements, increase interoperability, shape acquisition programs to prioritize joint solutions, and develop regulatory policies and procedures. To date, the Task Force has developed a Service Oriented Architecture (SOA) for GCS using standard data models and SOA service interface definitions. The architecture will serve as a basis for acquiring, integrating, and extending the capabilities of the GCS across the UAS portfolio. Implementation and adoption of an OBM for the GCS will leverage the collaborative innovation of numerous participants across DoD and industry permitting shared risk, maximized asset reuse, and reduced total ownership costs. There are ten components that are essential for adherence to an OBM: acquisition strategy, contracting strategy, intellectual property rights, design disclosure, strategic reuse, collaborative development, technology insertion, testing strategies, automated tools, and certification. DoD will develop acquisition strategies across the UAS portfolio that are built on continuous competition and reuse of services within the GCS architecture. The goal is to create an environment where innovative technology providers and integrators – both large and small – can freely and openly participate in competitions for a wide range of services or system domains. 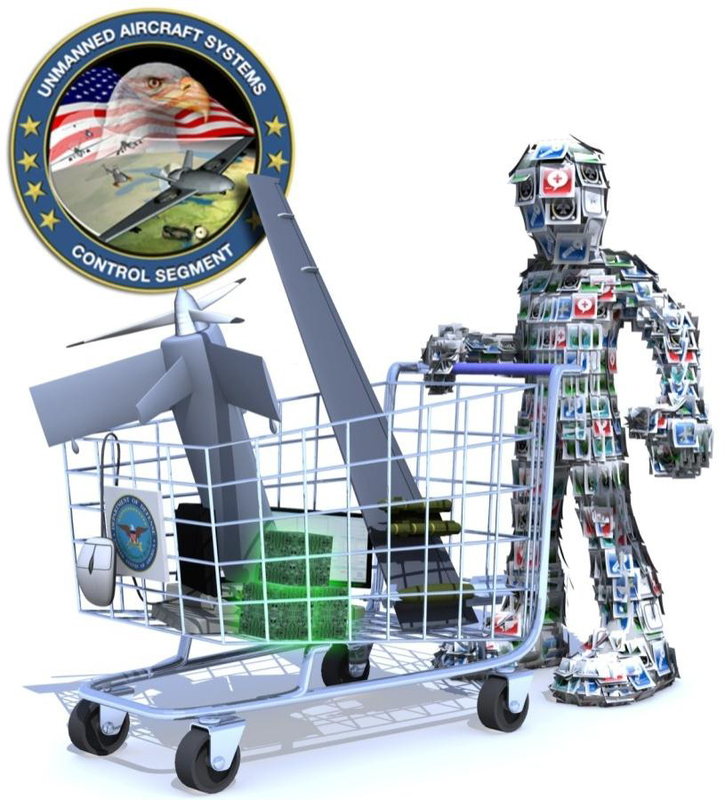 There are two different integration models for the UAS GCS: (1) the Contractor Integrator Model whereby the Government acquires services from multiple contractors and one contractor serves as the integrator or (2) the Government Integrator Model whereby the Government acquires services from multiple contracts but serves as the integrator for the services. DoD will also include open business and technical attributes as factors of evaluation for new contract awards and will incentivize Industry for adopting an open systems approach. Various contracting approaches are being considered including Indefinite Delivery/Indefinite Quantity (ID/IQ) contracting vehicles which maximize opportunities for competition and flexibility. Industry should take advantage of the multiple opportunities afforded to them via an ID/IQ contracting approach and other flexible contracts and should recognize the additional profit potential from using incentive – based contracting vehicles under this construct. Contracts will also be structured to leverage the rights granted to the government while protecting industry’s private investment in its intellectual property. The ability for DoD to exercise its IP rights is a critical enabler to support continuous competition, design disclosure, strategic reuse, and collaborative development. In support of this approach, the DoD will exercise and manage its data rights more diligently. Likewise, industry should become more knowledgeable on the rights granted to DoD and be prepared to articulate a value proposition when they choose to operate with a limited IP business model. Another key attribute to the GCS OBM and the Department of Defense’s Better Buying Power Initiative 2.0 is to eliminate redundancy within the Warfighter portfolios. Having early and often access to software and system design artifacts for which the DoD holds IP rights will help achieve this objective. DoD will open up its Research and Development (R&D) activities to drive more innovation and share design artifacts across many UAS programs to drive down costs. Companies that continue to invest in innovation and open up their R&D activities will be more competitive in the marketplace and will receive additional consideration during source selections. For industry, this attribute of the OBM will enable greater value capture, by utilizing key internal and external assets, resources, and/or positions. Sharing design artifacts will facilitate reuse of services across the multiple, distributed UAS platforms. The reuse of services will include certification package reuse for safety critical and security management services. This reuse of certification artifacts will result in further cost and schedule savings. DoD is adopting a systemic approach to reuse with a structured plan and well-defined processes and commitments for funding, staffing, and incentives to begin integrating services into legacy UAS programs. SOA Services will be competed to bring the best technology to the Warfighter and widen the current defense industrial base. A Collaborative Development Environment (CDE) is being established by DoD to foster innovation and build an ecosystem where DoD, integrators, suppliers, and new market entrants can collaborate and leverage one another’s IP, via appropriate licensing, and break down current closed IP business models. Technology Insertion (TI) plans are being developed to evolve the GCS either incrementally or as large all-encompassing upgrades, to inject mature technology innovations into fielded systems as well as systems under development. DoD must establish a culture that regularly embraces technology refreshes in order to increase the rate at which new innovative technology is adopted without having to acquire an entirely new system. The integrator will need to work with other vendors and research institutions to champion TI and assist in the adoption of TI roadmaps into current programs. Changes in how the DoD approaches software testing and verification are required to drive down costs. The Department is planning to adopt unit test reciprocity between the Services and Programs in addition to standards for test automation. Test reciprocity will apply to Unit Testing in an effort to reduce the number of redundant tests to be developed by the Services and Programs as they attempt to reuse services. The Task Force will follow the commercial software Industry lead in gaining test efficiencies by using a “test utility” or Next Generation Test (NGT) model. The success of the NGT model is attributed to the use of automation and predictive analytics. Automation tools will aid in the creation, management, and requirements based testing of services. The UAS development community will start using a set of tools to automate the design processes and artifacts associated with the GCS. Any reduction in development or test time realized through the use of automation tools is time gained in fielding new capabilities to the Theater Commander at reduced cost. As the GCS community continues to evolve to where services are reused across the enterprise, the potential to increase the certification overlap between the Services exists. Granted each Service is responsible for obtaining Information Assurance (IA) and Flight Safety certification for their PoR. The goal is to have components based on Design Assurance Levels ranging from catastrophic (Level A) to non-critical (Level E), and the subsequent certification artifact reuse and disclosure become the key elements for certification overlap. The increasing role of UAS within the twenty-first century Defense environment will drastically change the operational requirements for DoD. The shift in power among states and non-state actors will require the best technology at the best value to DoD. The establishment of OA within the UAS portfolio coupled with an OBM and increased transparency and collaboration will ensure a more efficient path to fielding capabilities for our Warfighters at significantly reduced costs. The adoption of this new model requires a dramatic cultural change by both DoD and Industry. We must strengthen our commitment to innovation and tap the ideas of many to meet tomorrow’s requirements while providing greater performance for the Warfighter at better value for the taxpayer.